“SHE BULLIED ME.” You know the problem. Your sweet, sweet students using the word “bullying” to describe any kind of conflict that results in their hurt feelings. Too much TV? Well-meaning but overbearing parents? Who knows. The struggle is real though. 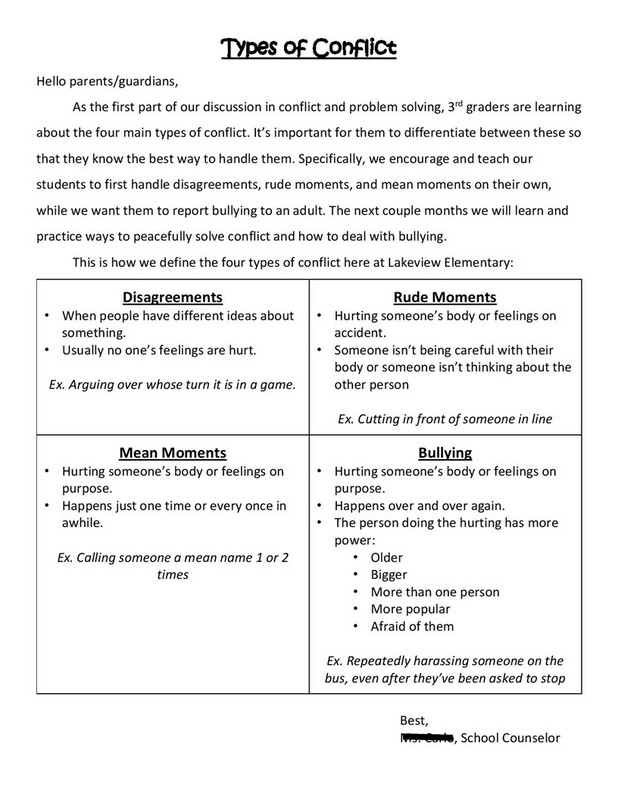 A couple years ago I stumbled upon the concept of the “rude moment” and “mean moment” as components of teaching types of conflict in a couple of great blogs (like this more recent one). 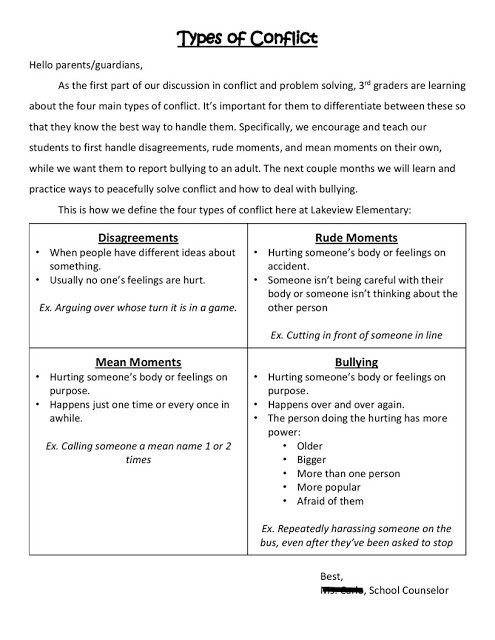 I decided to jump on the bandwagon and include this as a lesson in my 3rd grade conflict resolution unit. 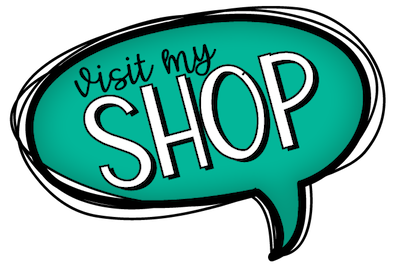 Part 1: Pre-Test. I give all the students this quick “test”, asking them to circle “PRE” at the top and reading it aloud. About 95% have no clue what the word “conflict” is. 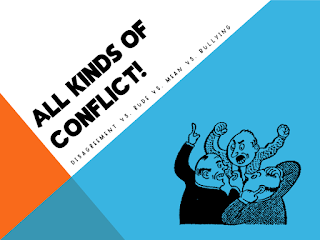 Part 2: PowerPoint presentation on “types of conflict” that I made. 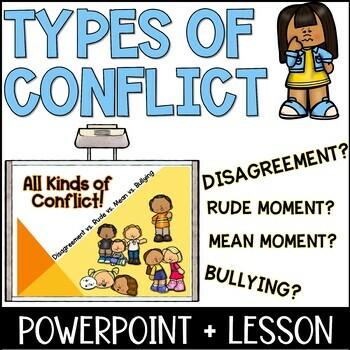 We learn about the type of conflicts and talk through some examples of each. They also tell me what size problem that type of conflict would be (tying it in to our previous lesson). 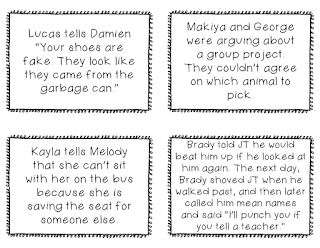 Part 3: Students sort definition/descriptor cards and example cards by the type of conflict. If I’m short on time, we do this whole group sitting in a circle. If we’re good on time, they do it in small groups. Part 4: Post-Test. Same test but this time I ask them to circle “POST”. I give them brand new tests/sheets for this because my students can’t handle keeping their pre test with them and not changing answers and/or fiddling with it, but that would be a great option for more mature/responsible students. Part 5: Parent Letter. 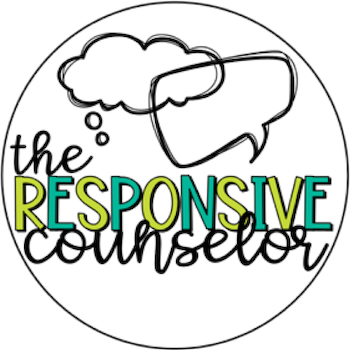 Parents are part of the problem and the solution in helping students correctly identify the type of conflict, which in turns help the students better at solving conflict peacefully (or getting an adult’s help when warranted). I send home this letter with all my 3rd graders after this lesson to help get everyone speaking a common language. 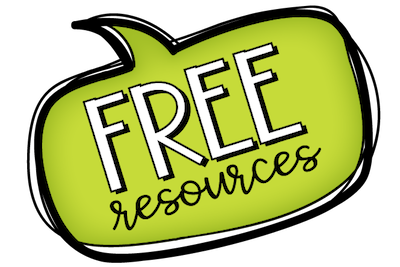 If you want the PPT and sorting cards to do this lesson plan yourself, you can find the whole lesson plan here in my TpT store.